The Public Domain Review is launched! Back in October, I posted a note about the Public Domain Review, an idea for a web-based review site for public domain works. Now the Public Domain Review has just gone live, to coincide with Public Domain Day 2011. 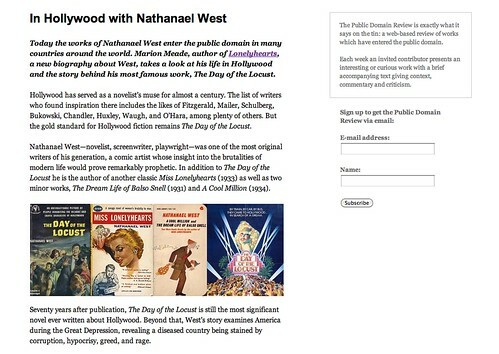 The first post is on the works of Nathanael West, whose works enter the public domain today in many countries around the world. If you’d like to follow the review, you can sign up to the mailing list or follow the Twitter account. This entry was posted in ideas, projects, publicdomain. Bookmark the permalink. Comments are closed, but you can leave a trackback: Trackback URL.